Explanation: The Geminids are expected to put on a good show this year. Created as planet Earth sweeps through dusty debris from extinct comet Phaethon, the annual Geminid meteor shower is predicted to peak on December 14th, around 0510 UT (12:10am EST). 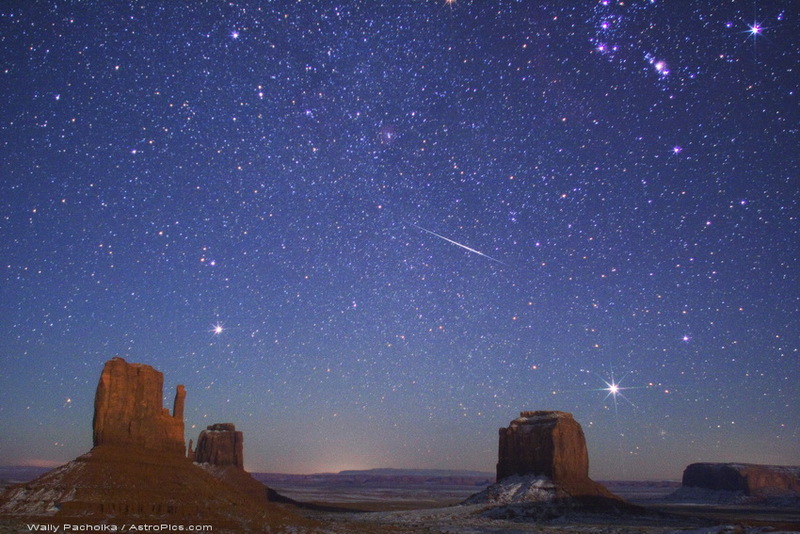 With better viewing for northern hemisphere observers, pictures of Geminids streaking through the night could include wintery landscapes, like this snow-tinged image of a 2007 Geminid meteor over buttes of the Monument Valley region in the southwestern US. The meteor streak points back to the constellation Gemini and the shower's radiant point, just off the upper left edge of the scene. Along with Rigel, the sword and belt stars of Orion are at the upper right. Near the eastern horizon are bright stars Procyon (left) and Sirius. The two buttes at the far left are known as The Mittens - clearly a reminder that if you want to watch a meteor shower on a cold December night, wearing mittens would be a good idea.